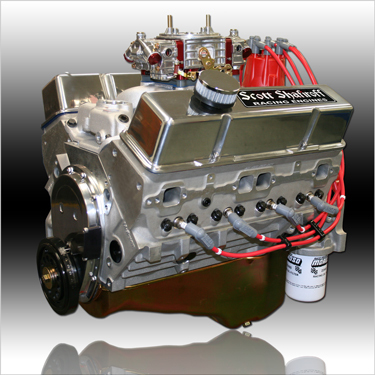 Imagine How Cool This All Aluminum Engine Is Going To Look In Your Hot Rod! Whether It's A '34 Roadster, An Early Nova Or Anything Else You Can Stuff A Small Block Chevy Into!! You Asked For It And We Listened! We Struck A Deal With AFR To Get Some Of The Hottest Cylinder Heads On The Market And When Combined With Our Special "Proprietary Grind" Hot Hydraulic Roller Cam, "Ultra Hi-Rev" Hydraulic Roller Lifters and 1.6 Ratio Pro Magnum Rockers, The Power Is Up Substantially!